This is the Hong Kong chapter of the second edition of the White & Case Asia Pacific Restructuring and Insolvency Guide. As we previously announced on 7 September, White & Case is very pleased to present the second edition of the White & Case Asia Pacific Restructuring and Insolvency Guide. The Guide gives a detailed overview of the restructuring and insolvency laws, regulations and procedures in 16 key jurisdictions: Australia, England & Wales, Hong Kong, India, Indonesia, Japan, Macau, Malaysia, China, Philippines, Singapore, South Korea, Taiwan, Thailand, US and Vietnam. On 1 July 1997, Hong Kong became a Special Administrative Region of the People’s Republic of China (the “PRC”), ending more than 150 years of British colonial rule. In general, the laws of Hong Kong as at 30 June 1997 were adopted as the laws of the Hong Kong Special Administrative Region (the “HKSAR”) with effect from 1 July 1997, except for those laws which were in contravention of the constitution of the HKSAR (the “Basic Law”). The most prominent feature of the Basic Law is the underlying principle of “One Country, Two Systems” whereby the previous legal system of Hong Kong will remain unchanged for 50 years. Under the Basic Law, all the laws previously in force in Hong Kong (common law, rules of equity, ordinances, subordinate legislation and customary law) shall be maintained, except for any that contravenes the Basic Law and subject to any amendment by the HKSAR legislature. National laws of the PRC shall not be applied in the HKSAR, except for a number of such laws relating to defence and foreign affairs which are listed in Annex III to the Basic Law. 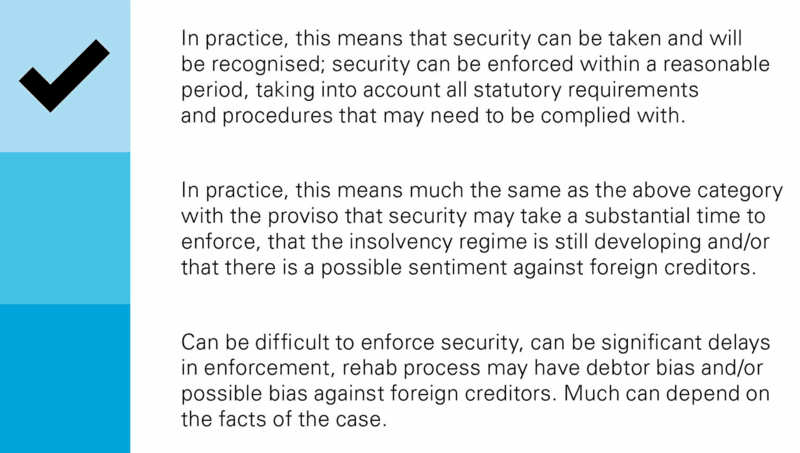 The insolvency regime of the HKSAR is broadly based on the English law insolvency regime which focuses on creditors’ rights as opposed to restructuring of debtors’ affairs. However, English law and Hong Kong law sometimes differ greatly in this area and there are traps for the unwary. 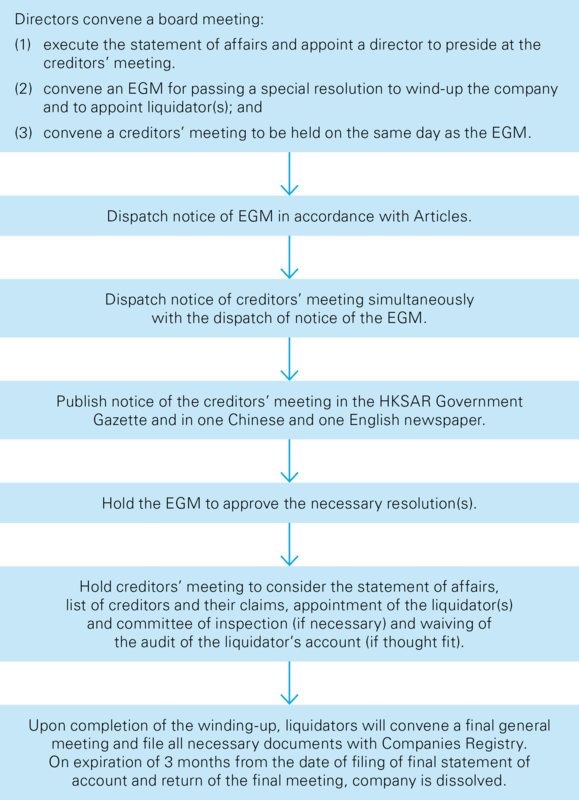 By way of example, the HKSAR insolvency regime does not have an equivalent of the English administration process or any other formal corporate rescue process. 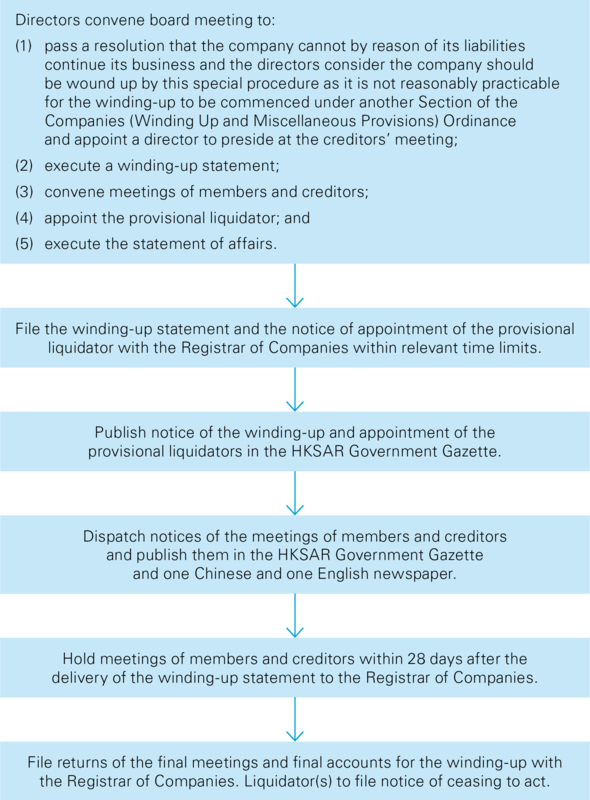 Terminology: under the laws of the HKSAR, the terms “winding-up” and “liquidation” have the same meaning and they have been used interchangeably in this memorandum. In HKSAR, the term “bankruptcy” is only used for personal (as opposed to corporate) insolvency. 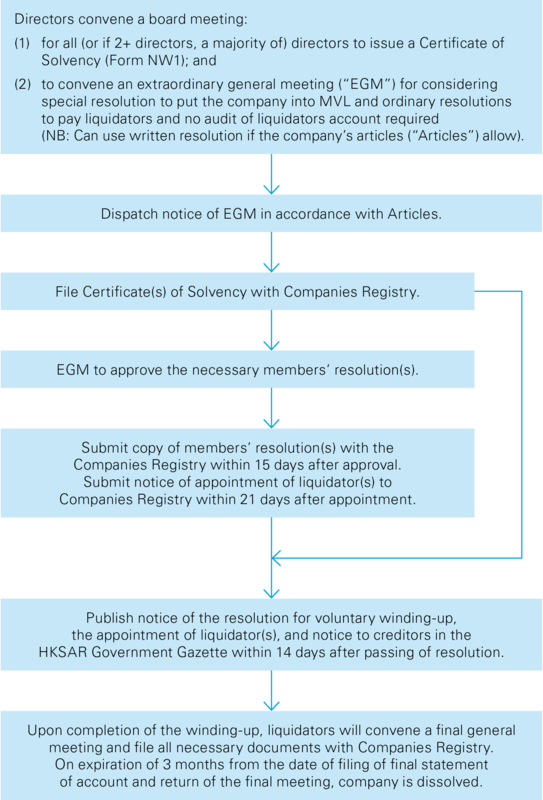 In the HKSAR, the main pieces of legislation dealing with corporate insolvency are the Companies (Winding Up and Miscellaneous Provisions) Ordinance and the Companies (Winding-up) Rules. Although the Bankruptcy Ordinance and its subsidiary legislation mainly deal with personal insolvency, certain provisions are also applicable in the liquidation of insolvent companies. Additional legislation: Some assets or entities may be subject to additional legislation that supplements or replaces that listed above. These are not covered in this memorandum. There are three main types of business entities in the HKSAR, being sole proprietorships, partnerships and companies. This memorandum considers the position of companies formed and registered in the HKSAR under the Companies Ordinance. Space constraints mean that this memorandum cannot consider entities that may be organised under their own piece of legislation (e.g. The Mass Transit Railway Corp.) or governed by special legislation (e.g. insurance companies), entities such as partnerships, trustees, pension funds, collective investment schemes or any entities organised under legislation other than the Companies Ordinance. Such entities may be subject to special regimes on insolvency. Companies can be private or public. A company will be a private company if its articles of association: (i) restrict a member’s right to transfer shares; (ii) limit the number of members to 50; and (iii) prohibit any invitation to the public to subscribe for any shares or debentures of the company. If any one of these three provisions is not in the company’s articles of association, then the company will be considered a public company. Not all public companies are listed companies. A company can be limited by shares (when members’ liability is limited to any amount unpaid on shares held by them) or limited by guarantee (when members’ liability is limited to the amount they undertake to contribute to the company’s assets if the company is wound up). A company not having any limit on the liability of its members is termed an unlimited company. Companies incorporated outside HKSAR that establish or have established a place of business in HKSAR are required to register as a registered non-Hong Kong company under Part 16 of the Companies Ordinance, and the companies commit an offence if they fail to do so. A company incorporated in the HKSAR or overseas (whether registered under Part 16 of the Companies Ordinance or not) may provide security over its assets by way of a mortgage, a charge, a lien or a pledge. Although the commercial effect of these types of security may appear similar, the legal effect can be different. A mortgage is a conveyance (or transfer) of title to property given as security for the payment of a debt. The conveyance is subject to the debtor’s right to redeem the title upon repayment of the debt (known as the equity of redemption). A legal mortgage is the transfer of the whole of the debtor’s legal ownership in the property being charged to the creditor along with a right to sell that property on default of repayment of the debt. An equitable mortgage is the transfer of only the debtor’s beneficial interest in the property, and no legal title is transferred. An equitable mortgage can arise where parties do not comply with the formalities necessary to create a legal mortgage (e.g. if they fail to execute a mortgage as a deed). A charge is created by contract. It transfers neither title in the property charged nor the right to possession; it merely gives the creditor certain rights over the property as security for a debt. Charges can be either fixed or floating. If the debtor defaults, the creditor will be entitled to apply for a court order to sell the charged property or appoint a receiver to take possession of it. The creditor’s claim to the proceeds of sale will be of higher priority than unsecured creditors. Fixed charges over the same asset rank for priority in the order in which they were created. A floating charge is not a concept that is often found outside of the English common law tradition. Given its flexibility, a floating charge has been proven to offer a number of significant practical advantages over a fixed charge. However, it has been, and remains, the subject of a great deal of case law. A floating charge is a charge over a class of assets, present and future, that a debtor may want to deal with at an unspecified future date. The assets are usually identified generically (e.g. current assets). Whilst the charge remains floating, the debtor may deal with the charged assets in its ordinary course of business (which can include sale). It is only upon the occurrence of certain specified events (such as the presentation of a winding-up petition against the debtor or default on repayment of the debt) that the charge will crystallise and be converted into a fixed charge. When the charge crystallises, it attaches to those charged assets which are at the time owned by the debtor. The debtor cannot then deal with the charged assets without the consent of the creditor. Floating charges over the same class of assets rank for priority in the order in which they were created. A floating charge is invalid if it is created within 12 months of the commencement of the debtor’s winding-up unless new money is lent in consideration of its creation. A pledge is a bailment of goods or delivery of documents to a creditor as security for a debt. Delivery is essential (although symbolic or constructive delivery may be sufficient). A pledge gives the creditor (i) a possessory right to retain the pledged asset until the debt has been repaid and (ii) the right to sell the pledged asset in order to satisfy an unpaid debt. Ownership in the pledged asset is not transferred. A lien is a legal right or interest a creditor has in another’s property, usually lasting until the debt or duty that it secures is satisfied. A creditor may take possession of the encumbered property (a possessory lien) and there may also be a power of sale. A lien can arise by common law, equity, statute or contract. An example is a bankers’ lien, being the right of a bank to satisfy a customer’s matured debt by seising the customer’s money or property in the bank’s possession. Certain types of unsecured creditors, known as preferential creditors, enjoy priority in payment over other unsecured creditors. Preferential creditors include employees and the government. If an insolvent company does not have sufficient funds to satisfy all unsecured creditors in full, any available funds will be used to satisfy payments to the preferential creditors in full before any amount is paid to the general pool of unsecured creditors. In the HKSAR, corporate insolvency matters are generally dealt with by the Court of First Instance of the High Court of the HKSAR (the “Court”). creditors’ voluntary liquidation (which can only be used if the company is insolvent). 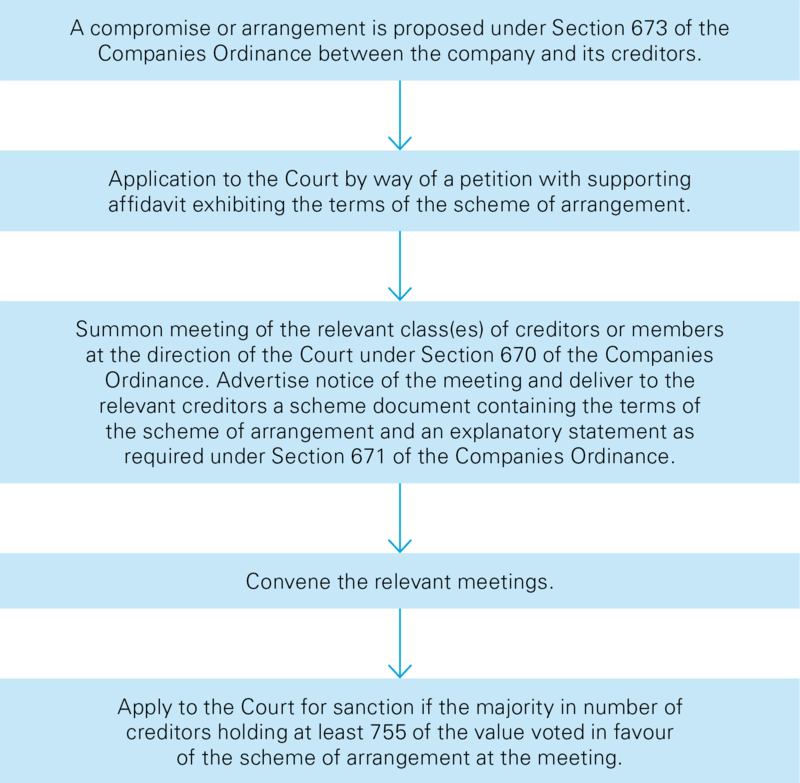 There is also a special procedure under which the directors of a company may put a company into creditors’ voluntary liquidation under Section 228A of the Companies (Winding Up and Miscellaneous Provisions) Ordinance (see below). As the directors must be able to make a declaration that the company will pay its debts in full, this is not a “true” insolvency procedure. If, during the course of a MVL, the liquidator thinks that the company will not be able to pay its debts in full, he calls a meeting of the creditors. there is no automatic stay on proceedings against the company, although a liquidator, any contributory or any creditor can apply to the Court for directions. This special procedure applies where the directors of the company, or if the company has more than 2 directors, the majority of the directors, form the view that the company cannot, by reason of its liabilities, continue its business. Compulsory liquidation involves the company being wound up by an order of the Court. Opposed petitions: The company may oppose the winding-up petition on various grounds (such as disputing the validity of the alleged debt owed). Other creditors can appear to support or oppose the making of a winding-up order. If no one appears to oppose the winding-up petition, the Court will usually make a winding-up order. Official receiver as liquidator: Once a winding-up order is made, a liquidator will be provisionally appointed (i.e. the appointment will be confirmed). This can be the Official Receiver’s Office (the “OR”), but due to the heavy workload of the OR, private insolvency practitioners can be appointed. For non-summary compulsory liquidation cases (i.e. where assets of the company exceed HK$200,000 in value), members of the “Panel A” scheme (set up by the OR) may be appointed. For summary cases (i.e. where assets of the company do not exceed HK$200,000 in value), it will remain with the OR or members of the “Panel T” scheme (set up by the OR) may be appointed. 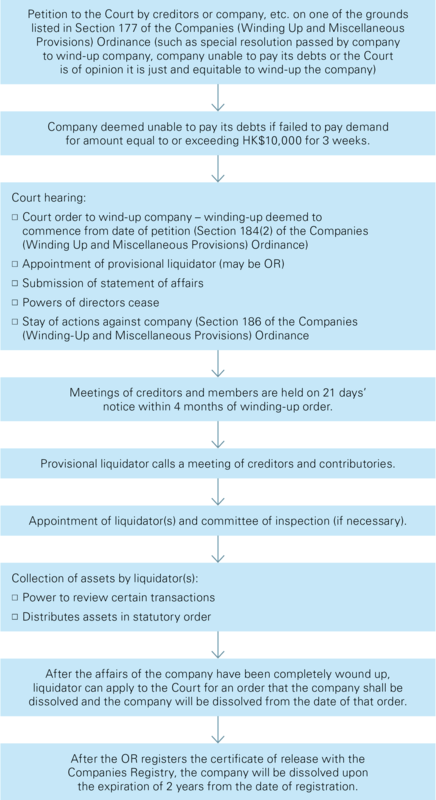 Liquidator’s powers: These are listed in the Companies (Winding Up and Miscellaneous Provisions) Ordinance. The company’s board of directors will be displaced once a liquidator is appointed. The liquidator will be the agent of the company and his actions will bind the company. Automatic stay: At any time after the presentation of a winding-up petition and before a winding-up order has been made, the company or any creditor or contributory may apply to the Court for a stay of proceedings. When a winding-up order has been made, no action or proceeding can be commenced against the company without the leave of the Court. PRACTICAL POINT: Which type of liquidation do creditors prefer for an insolvent company? A CVL is generally quicker and cheaper (there is no court involvement). However, CVLs do not have an automatic stay of proceedings, although directions can be applied for. The involvement of the Court and the OR in a compulsory liquidation generally mean more expense and delay, but there is an automatic stay. In practice, members and creditors may prefer a compulsory liquidation if they feel that the conduct of the management requires investigation. In complex or cross-border cases, compulsory liquidation will usually be the appropriate procedure. The Court may appoint a provisional liquidator at any time after the presentation of a winding-up petition and before the making of a winding-up order. The application for the appointment may be made by any creditor or contributory, the petitioner (i.e. the person who presented the windingup petition) or the company itself. The purpose of appointing a provisional liquidator prior to the winding-up order is to preserve the company’s assets in the interval between the presentation of the winding-up petition and the making of the winding-up order. The provisional liquidator may be the OR or any other competent person. When a provisional liquidator has been appointed, no action or proceeding can be commenced against the company without the leave of the Court. Most restructurings are informal and conducted outside of any formal insolvency or restructuring regime. Usually a standstill agreement is entered into between the company and its major creditors, which would include a moratorium to ensure that individual creditors do not bring enforcement proceedings independently, and would provide that financing and credit facilities are maintained whilst information is collected and the company is appraised. Thereafter, the company may enter into a restructuring agreement with creditors to facilitate a restructuring. The “Hong Kong approach to corporate difficulties” are formal but voluntary. These non-statutory guidelines set out how institutions should deal with borrowing customers in corporate difficulties. These are issued jointly by the Hong Kong Monetary Authority and the Hong Kong Association of Banks. an official copy of the court order sanctioning the scheme of arrangement is delivered to the Companies Registry for registration. PRACTICAL POINT: The procedure for implementing a scheme of arrangement is cumbersome. What are the advantages? The procedure for implementing a scheme is cumbersome, expensive and time consuming, involving as it does a formal court procedure. However, one of the main advantages of schemes is that, once the appropriate approvals are obtained and the scheme is sanctioned by the Court, it is binding. Schemes can be particularly useful where large numbers of creditors are involved and the number and nature of all claims may take some time to determine, such as in the case of insurance companies. Furthermore, documentation allows the draftsman flexibility, and a scheme can be drafted so that it deals with and binds just one class of creditors (for example, secured creditors). Perhaps one of the major headaches with schemes is the classification of creditors necessary to obtain the appropriate consent and sanction of the Court. Unfortunately, recent case law has not necessarily clarified these issues. A creditor with a fixed charge can appoint a receiver to enforce his security over the charged asset. This is a contractual remedy without recourse to the court (contrast to a creditor petitioning for a compulsory liquidation). A receiver is appointed under the terms of the relevant security document, and the appointment takes effect when it is accepted by the receiver. The company will usually continue to be controlled by its board of directors even after the appointment of a receiver (contrast to a compulsory liquidation when the powers of the board cease on appointment of a liquidator). The receiver’s primary duty is to the fixed charge holder. However, a well-drafted security document will include an express provision that the receiver is acting as the agent of the debtor company. This seeks to avoid or minimise any potential liability for the creditor. The fundamental role of a receiver is to receive, collect and/ or sell the charged assets in order to satisfy the debt owed to the creditor. If a more active role is required (e.g. carrying on the business of the debtor), it will be necessary to appoint a manager and the security document should provide for this. PRACTICAL POINT: Unlike under English law, there is no administrative receivership under Hong Kong law. Many, but not all, receiverships end in the liquidation of the debtor. The more profitable parts of the debtor’s business might be “hived off” into a special purpose vehicle which could be realised separately. Alternatively, the loss-making business of the debtor may be disposed of to leave the debtor with a viable core business. Depending on the terms of the security document, receivership can sometimes be used as a rescue procedure. In a liquidation, the liquidator will realise the assets and apply the proceeds to pay creditors’ claims. First, creditors secured by a fixed charge or mortgage are paid out of the sale proceeds of the asset subject to that charge or mortgage (less the costs of realisation). Fixed charges over the same asset rank for priority in the order in which they were created. After that, preferential creditors, floating charge holders and liquidator’s costs and remuneration are paid. Once preferential creditors have been paid in full, floating charge holders are paid from the proceeds of sale of the asset subject to that floating charge. Floating charges over the same asset rank for priority in the order in which they were created. After the floating charge holders have been paid in full, any surplus is paid to the unsecured creditors, followed by any claims from post-liquidation interest. Any remaining assets are used to repay the shareholders’ capital contributions (unlikely in any insolvency). Distributions are made when sufficient funds are available. Each creditor will be paid its full entitlement under one category before any lower category is paid. If the value of any security does not cover the whole debt, the remaining unpaid debt will rank as unsecured. Creditors who can establish valid retention of title or other proprietary claim will have their property returned (or its monetary value) in priority to all of these claims. Set-off may affect the amount due to a party (see below). In a restructuring, the extent to which creditors are given priority will be a matter of negotiation between the parties. Legal set-off: This can only be resorted to as a defence to a court action and is available where the two claims are liquidated or ascertainable with certainty and are both due and payable at the commencement of the action. The two claims do not have to arise from the same transaction or closely connected transactions. This can apply in receivership but does not apply in liquidations. Equitable set-off: This is available to a debtor outside the context of litigation where his cross-claim arises from the same transaction (or a closely related transaction) as the debt owed, and is available where either and probably both of the claims may be for an unliquidated sum. A debtor can simply deduct the amount of his mutual cross-claim from the debt he owes and tender the balance of the debt (if any) to the creditor. However, the sums in question must be due and payable, or in the case of unliquidated damages, must be a reasonable assessment of the loss made in good faith. This can apply in receiverships but does not apply in liquidations. Banker’s set-off: This is known as “the right to combine accounts”. It arises where a customer has more than one current account with his bank, at least one of which is in debit and one of which is in credit. This remedy can be automatically exercised without formality. Statutory set-off: This is a mandatory set-off that applies in liquidations where there have been mutual dealings. This can apply to contingent and unliquidated claims. MVL and CVL: No automatic stay, but application for the Court’s directions can be made. Compulsory liquidation: After presentation of a winding-up petition and before a winding-up order has been made, application can be made to the Court for stay. Once an order has been made, no action or proceeding can be commenced without leave of the Court. S.228A special procedure: No automatic stay, but application for the Court’s directions can be made. Provisional liquidation: Once provisional liquidators are appointed, no action or proceeding can be commenced without the leave of the Court. Scheme of arrangement: No automatic stay. In the HKSAR, foreign judgements and orders may be enforced under a statutory registration scheme on the basis of reciprocity. Provided that the relevant requirements as set out in the Foreign Judgments (Reciprocal Enforcement) Ordinance (Cap. 319) are met, the foreign judgment would be registered and the judgment debtor would be informed of the registration. With respect to foreign judgments that may not be registered under the above scheme, they may be enforced under common law rules since a foreign judgment itself may form the basis of a cause of action. Transactions that give rise to an unfair preference: a company gives an unfair preference to a person if (i) that person is one of the company’s creditors or a surety or guarantor for any debts or other liabilities; and (ii) the company does anything or suffers anything to be done which has the effect of putting that person into a position which, in the event of a winding-up of the company, will be better than the position he would have been in if that thing had not been done. The unfair preference has to be given within 6 months before the commencement of a winding up (or 2 years if the creditor preferred is an associate). If such a situation arises, the transaction concerned will be void and the party who benefits from the transaction will be restored to the position that it would have been in if the unfair preference has not taken place. Transactions at an undervalue: One of the significant changes brought about by the Amendment Ordinance5 (see the section on “Pending or New Legislation” below) was introducing the power of the court to set aside transactions at an undervalue entered into by a company within 5 years before the commencement of its winding-up. A “transaction at an undervalue” is a transaction entered into by a company prior to its winding-up that involves a gift by the company, or for consideration that is significantly less than the value of the subject of the transaction. Avoidance of floating charge: Where a company is being wound up, a floating charge given over the company’s assets may be considered invalid if such floating charge was created within 12 months of the commencement of the winding-up, unless it is proved that the company was solvent immediately after the creation of the charge, or to the extent of any new cash paid to the company at the time of or subsequently to the creation of and in consideration for the charge. Other situations: there are other situations where liquidators may be able to recover assets transferred to third party, for example, disposition of property with an intention to defraud creditors, or certain parties knowingly assist the trading of the business of a company with an intention to defraud creditors or the trading of business of an insolvent company, etc. On 3 June 2016, the Hong Kong Government gazetted the Companies (Winding Up and Miscellaneous Provisions) (Amendment) Ordinance 2016 (“Amendment Ordinance”), which amended the winding up provisions in the Companies (Winding Up and Miscellaneous Provisions) Ordinance and the Companies (Winding-up) Rules. The date of commencement of the Amendment Ordinance will be appointed by the Secretary for Financial Services and the Treasury by a further notice to be published in the Gazette. Further enhance the integrity of the winding up process. provide for insolvent trading (even without criminal sanction). Corporate rescue: There has long been an acknowledgement in insolvency law circles that HKSAR needs a statutory corporate rescue mechanism, but legislative attempts in the past to implement such mechanism have been unsuccessful and the process has progressed very little and has appeared to be stalled. The Law Reform Commission of the HKSAR first published a report on “Corporate Rescue and Insolvent Trading” in 1996, which was followed by legislative proposals to implement the report’s recommendation. In particular, the Companies (Corporate Rescue) Bill 2001 envisaged a procedure whereby the directors of a company can resolve that a “provisional supervisor” will take charge of the company. Once the requisite documents have been filed, the company will be subject to a moratorium whilst a plan is devised and voted on by the creditors. However, the Companies (Corporate Rescue) Bill 2001 encountered serious criticism, and it was eventually lapsed. In late 2009, the Financial Services and the Treasury Bureau (“Bureau”) conducted a public consultation on the conceptual framework and a number of specific issues relating to the corporate rescue procedure and insolvent trading provisions, and issued its consultation conclusions in July 2010. In March 2013, the Bureau announced that it has reviewed some of the more contentious issues of the proposals and considered in detail other key issues which were not discussed in the 2009 consultation. The Bureau announced in May 2014 a package of legislative proposals for the introduction of a statutory corporate rescue procedure and insolvent trading provisions, which received broad support of the Financial Affairs Panel of the Legislative Council and relevant stakeholders to the legislative exercise. The Bureau announced that it plans to further discuss with stakeholders to prepare detailed proposals to pave the way for drafting the legislation in the future. Most recently, the Bureau said that their target is to introduce the relevant amendment bill into LegCo in 2017/18. Download the PDF of the Hong Kong chapter. If you would like a copy of the full Asia Pacific Restructuring & Insolvency Guide please register your interest here. 1 This aspect of fixed charges is the subject of a great deal of case law, most recently by the House of Lords in National Westminster Bank Plc v. Spectrum Plus Limited & Others  UKHL 41. Whilst English decisions are not binding on Hong Kong courts, they are likely to be persuasive, especially judgments of the House of Lords. 2 Also known as a Romalpa clause following the English Court of Appeal decision in Aluminium Industrie Vaasen BV v Romalpa Aluminium Limited  1 WLR 676. 3 Noted that the law in HKSAR regarding so-called “Slavenburg” registrations by non-Hong Kong companies changed on 14 December 2007 when the Companies (amendment) Ordinance 2004 came into force. Currently, only charges created by a Part 16 registered non-Hong Kong company need to be registered. 4 Re. 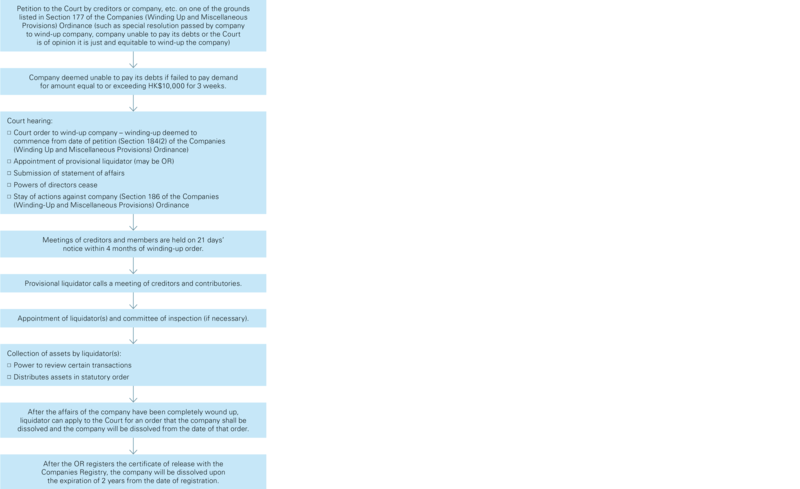 Keview Technology (BVI) Ltd  2 HKLRD 290; see also Re. Legend International Resorts Ltd  2 HKLRD 192 and  HKEC 396. 5 The date of commencement of the Amendment Ordinance will be appointed by the Secretary for Financial Services and the Treasury by a further notice to be published in the Gazette. Singapore: Asia Pacific’s Debt Restructuring Hub?